Andy goes to the "Big City"
Hey all, well my pal Andy went to the big barista jam in Chicago last week-end. 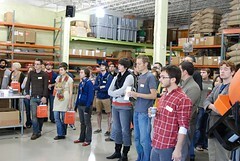 Here is a photo of some of the jammers first thing Saturday morning. I am sure the were more lively later in the day. Mass amounts of caffine were consumed. I mean if you are going to hang out in a great roastery like Intelligentsia and play with coffee all day what do you expect! I had to miss this blessed event, but just ask Andy about it. He had a great time and learned a lot of great stuff!